I am primarily a textile artist, but also enjoy many other arts and crafts. I have taught Art and Design and Technology Textiles in secondary schools for over 17 years and in the summer of 2018 I retired from full time teaching. My time is now flexible. I am looking forward to teaching more workshops on a wide range of subjects from Painting and Drawing to Felting and Sheep making, Weaving and Flower Arranging, and even Doodling. I also give talks on my subjects. 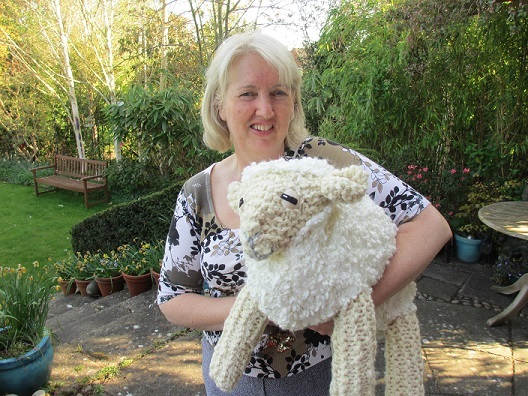 I will be be involved in Exhibitions and Craft and Wool festivals. I am currently exploring the possibilities of the Embellisher, a machine for felting, which I use with wool fibres and yarns on a variety of base fabrics some that move in the breeze others on more traditional canvas stretchers. I would describe the techniques I use as 'painting with fibres'. I am passionate about texture and I adore the tactile nature of trees and their form and structures. My work draws from the East Anglian landscape and woodlands. Some pieces of my work are quite bright and colourful almost to a degree of naivety, while others are of muted tones and colours relying on their textures to tell the story. The scale of my work varies from tiny 5cm square landscapes to much larger layered atmospheric pieces over 100cm x 210cm x 75cm. I like to create images that are figurative and quirky and would expect the viewer to either smile or have a puzzled expression. I graduated from Loughborough College of Art in 1979 with a degree in Textile Design, I then spent 9 months on a Craftsman in Schools Project in Swansea, sponsored by West Glamorgan education authority and West Wales arts association, where I was based at Pentrehafod school and known as the Swansea Weaver. While there I worked on commissions for 2 local schools and a commission for BP chemicals in London. I returned home to Hertfordshire in 1980. After exhibiting at the Rhodes Centre in Bishop Stortford, I was offered a weaving studio by Lady Bingley so 'The studio in the Barn' was opened which later featured in the Doomsday Project, an early internet website. I taught weaving evening classes and worked on commissions (including pictures for 3 different MacDonald's restaurants) and towards exhibitions. Between 1982 and 1983 I took my PGCE at Middlesex Poly to teach Art and Design in secondary schools. While teaching art part time 1984 I was offered a one person exhibition in the concourse gallery in the Barbican Centre in London. It was called 'Woven Images' and was featured on BBC television's Blue Peter, I was invited to the studio with my loom and interviewed live on Blue Peter. I had included in the exhibition a life size sheep mobile, which had 3 fluffy sheep dangling from the ceiling; this was later bought by Sir Freddy Gibberd (the famous Architect ) and hung for many years from a cherry tree in his garden, which has become the Gibberd foundation. While trying to sell weaving at craft fairs I soon realized that I needed some less expensive items to sell and so 'Sheepy Things' was born. I started making brooches from pipe cleaners and fleece; they sold well, so added mobiles to the range, then standing sheep. I met John Napier at Living Crafts at Hatfield House in 1985 and he asked if I would supply the Sheep Shop in Covent Garden, which I did for many years until it closed. Cardtoons Ltd saw my sheep there and in 1987 asked me to make them some Sheep pencils, they became my distributor and we now have over 20 different Sheepy Things for sale in the Lake District and beyond. I had two sons in 1985 and 1987 so the sheep business fitted in well with being a Mum! I returned to teaching in 2001 and have continued with the sheep. I now have a granddaughter and a grandson who both enjoy the sheep mobile that hangs in their bedroom.